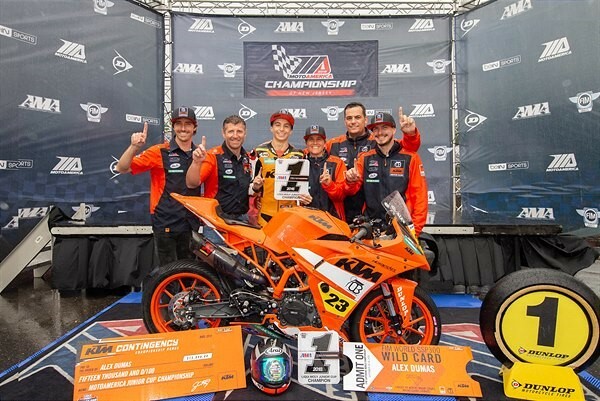 Millville, NJ (September 9, 2018) – Alex Dumas and the KTM Orange Brigade Road Racing Team wrapped up the inaugural MotoAmerica Junior Cup Championship on Sunday in difficult conditions at New Jersey Motorsports Park. Dumas rode a conservative, championship-winning race on a rain-soaked track on the RC 390 R, equipped with the new SS300 Race Kit, to mark the first-ever U.S. National Road Racing Championship for the KTM brand and further extends this significant accomplishment from the young Canadian native. Through the first 15 races Dumas has earned eight victories and two podium finishes, making him the most winningest rider in MotoAmerica’s young Junior Cup history. The 2018 Champion will continue to battle for race wins as the series heads into its final two races of the season at the end of the month. Dumas endured a tough day on Saturday. He got a good start from third on the grid and was running inside the top five when he made a mistake in the difficult, wet conditions and crashed out with four laps to go. Sunday’s race saw Dumas get another good start and intelligently slow his pace as his championship rivals struggled to come to terms with the rain-soaked track. His seventh-place finish was enough to secure the Junior Cup Championship with two races to go in the series. In addition to a $15,000 championship bonus check from KTM North America, Inc., Dumas has been presented with a wild card opportunity to represent North America under the canopy of the German KTM-Supported Team Freudenberg in the WorldSSP300 class for Round 11 of the FIM Superbike World Championship in Magny-Cours, France. Dumas will be racing a KTM RC 390 R with the competitive Customer Racing SSP300 kit, just like the one he pilots in the U.S. MotoAmerica Championship. Dumas’ teammate, Sean Ungvarsky, showed a return-to-form after struggling at the previous round. He got a good start in Saturday’s Race 1 and quickly worked his way up the running order to a seventh-place finish. In Sunday’s Race 2, Ungvarsky struggled with the more difficult conditions and finished in eighteenth-place.